You need to upgrade your Flash Player Please download the latest Flash Player. In the 19th century, the name of "Milleret" was an old family name anchored in the Jura Mountains in Switzerland. In the old days, a lot of farmers, including a Milleret family, developed small watch-workshops at their home to occupy the long winter season days. After practice on pocket watches belonging to gentlemen and dealers of the high society, a few self-taught and ingenious of these autodidacts created single mechanical pieces which have become invaluable timekeepers now. This know-how has been transmitted through generations and belongs now to our heritage. The second and current part of Milleret's story started in London. It was during an auction at the end of the nineteenth century when a businessman in fine diamonds and jewellery, saw a beautiful silver pocket watch branded Milleret 1883. As a fervent watch lover, his wish to develop this name based on an historical source made its way in his mind... and after a few years of work in the backstage the new Milleret has been introduced with a touch of freshness and spontaneity. 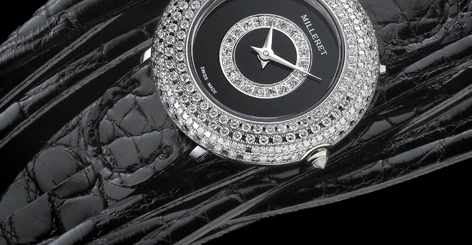 By combining traditional hand-craftsmanship and more than 40 years of experience in fine diamonds and jewellery business, Milleret successfully entered the universe of luxury and precision watch-making. 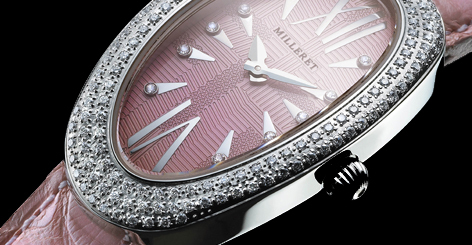 From its name and location Milleret has inherited a great know-how and has a huge respect for the Swiss watch- making values. Making best use of its affiliation to a jewellery group, Milleret matures in its independent atmosphere balanced between purity of diamonds and refined style. 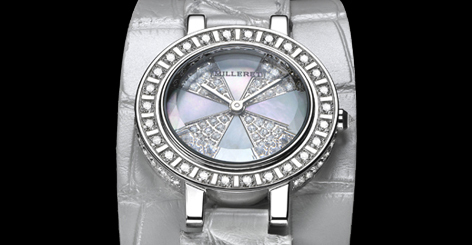 Milleret timepieces are created with the most contemporary watch-making technologies, making use of the ultimate tools of our time: the skilled hands of designers, watchmakers and diamonds setters. These men are real artists expressing their creative potential, originality and passion through every single pieces coming out from their workshops. Independent and intuitive, Milleret applies itself to perpetuate this art. Milleret manufactures its products and shapes the various faces of its success making us of its first and main area of expertise: diamonds, the most solid stones in the world. 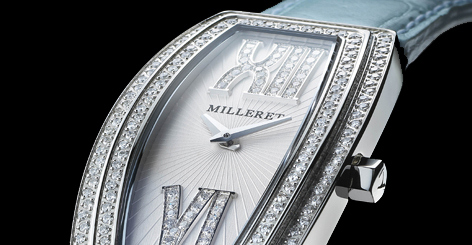 Based on the historic skills of its founders in the art of cutting diamonds to turn them into timeless witnesses, Milleret has always aimed at first quality choice and can therefore create audacious combinations of design and diamonds. Diamonds are eternal. And above all, there are "women's best friends" because of their beauty, brilliance and uniqueness, just like the woman who wears them. The thing that everybody forgets to mention is that diamonds do for you what neither machines nor technological inventions will ever do : they touch a woman's heart. We offer you the way to reach it with our Milleret collection. "Solstice" is the topic of our new visuals. Etymologically, "solstice" means "the sun stood still". It is this period of time when the sun appears to rise and set at almost exactly the same place during consecutive days. The solstices are these two opposite and slightly ambiguous moments of the year … the shortest day, the longest night or the longest day and the shortest night. Solstices were and are still celebrated in some communities. They crossed the centuries with intense mysterious tones, but always tinged with subtlety, delicacy and wordless beauty. Through our new campaign, we tried to perpetuate this kind of surrealistic hours when reality meets the world of dreams, when daylight meets the darkness of the night in an atmosphere full of inspiration, emotions, passion and suggestiveness. Like a rain drop with its pure and aesthetic lines, the ANACONDA reproduces an original and harmonious expression of femininity. Its distinctive curved profile makes it unique. It can't fail to fit the wrist perfectly, reinforcing your own identity and feeling of independence. See it... feel it... allow yourself to be enticed by our steel bracelet. A special steel bracelet designed by Milleret to fit its case in perfect harmony. 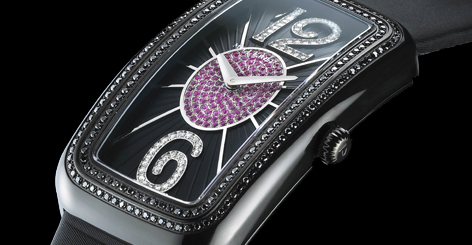 Available in two sizes, this line offers a choice of diamonds settings and dials. For the woman who manages a corporate takeover and rush hour traffic, all in a day's work. Through an inspiration of modern and every day luxurious way of living, Diva pays tribute to her independent spirit. Elegant, it fits perfectly into an active, social lifestyle. 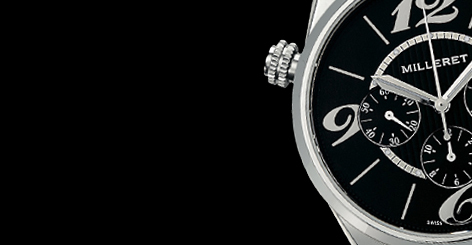 Available in two sizes, this line offers a choice of diamonds settings and dials. Available on steel bracelet. When charm meets sensuality... Elegant and seductive, GALA will catch everybody's eyes. Through the Gala "Black Dress" and its setting of black diamonds, the secrets of the Solstices are almost unveiled. This model reflects an inimitable and distinctive character like the woman who will wear it. Available in seductive small size or in magnificent large size, this line offers a choice of diamonds settings and dials. Own a piece of eternity... A contemporary piece transformed with modern sensibility and passion for excellence. The Pavée shines like a star in the sky. Isn't this the ultimate jewellery to express your love or to mark an important moment of your life, making it an unforgettable memory? 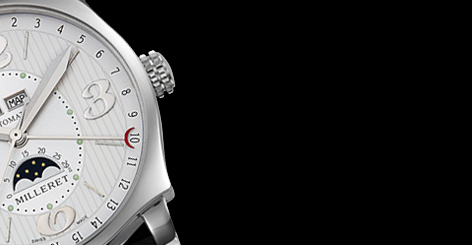 In accordance with your preference, this model is available with a yellow or white gold case. For an increased glamorous effect, it is also available on its elegant gold bracelet. The elegance of the curves and the symmetry of the lines come together, balanced in the most harmonious way, to create the Eighteen Forever family. Shaped in precious material set with diamonds, the round and squared lines reinvent "art-deco" style with a modern retro feeling. The strong appeal of our XXL models is the essence of the contemporary watch-making, with its modern interpretation of the classical watch shape. A perfect balance between concept and beauty in large size. From classic-elegant style to a free sportive attitude, every single man will find the model which best suits him. Also available in stainless steel bracelet. 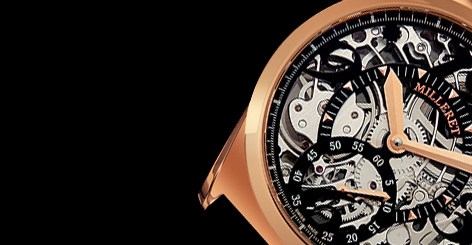 Small complication watches for men are made to be perfectly adapted to any situation a man may go through during his life. Strong and refined lines give these models the typical character a man is looking for. In the aftermaths of the "art that can be worn" appeared the compelling desire to develop this limited edition. Unifying the meticulous works of master craftsmen, this skeleton watch will provide the exquisite touch to its daring and open-minded owner. Thank you for your interest in Milleret. Please do not hesitate to contact us should you need any further information. We will be pleased to assist you. In a world of mass production and extreme competition, who hasn't dreamt of possessing a prestigious handcrafted timekeeper? Whether we achieve our dreams or not, we want to keep them and make them last forever. Designed to function 24 hours a day for several generations, your quartz or mechanical Milleret watch deserves the best possible care. The battery lifetime featured in our quartz models will remind you at regular intervals that it is time to hand it out to the good care of our watchmakers. Good care and attention are necessary with mechanical watches, but the lubricants and seals, as they age, will tell you the time to offer your watch a rejuvenating session. Please take a moment to read the booklet you receive with your watch and simply follow the instructions. In doing so, you will maintain the reliability and precision of its various functions and enjoy it for years. Together with our partners, we commit ourselves to offer you irreproachable quality of after sales services. Any defaults in the manufacture or in the materials will be covered for a period of 3 years; damages resulting from careless handling excepted.